I thought I'd do a little CAL round up this week because we have a few starting this month including my very own - the Back To School Sweater CAL!! I just LOVE a good crochetalong . Check out my post 5 Reasons to Join a CAL in my blog archives! I'm hosting this CAL (the accompanying blog hop is already underway) with Helen of Making at Number 14! It starts on the 16th of September and runs for 8 weeks until 17th of November. All the details are on my CAL page on my website here. You can chose to make any crochet garment and a few enthusiastic folk have started already!! We're using the hashtag #BackToSchoolSweaterCAL to share our progress on Instagram and there is chatter in Fay's Crochet Circle Podcast Ravelry group here. Clarisabeth from the Crochet Cakes Podcast is hosting a Spotting Clouds Top CAL. This top is designed by Christina Hadderingh who designed the extremely popular Hotel of Bees Shawl so I know the pattern will be well written because I've made this shawl. It started on 21st of August and runs until 14th of October so there is still time. You could make this one for your Back to School Sweater CAL... that's a possibility!! The details and chatter are here in the Podcast Ravelry group. Hannah from the Cozy Cottage Podcast is hosting a shawl crochetalong called the September Shawlalong which runs for the months of September and October. I'll definitely be joining in with this ... and I may well be double dipping with the next CAL on this list. 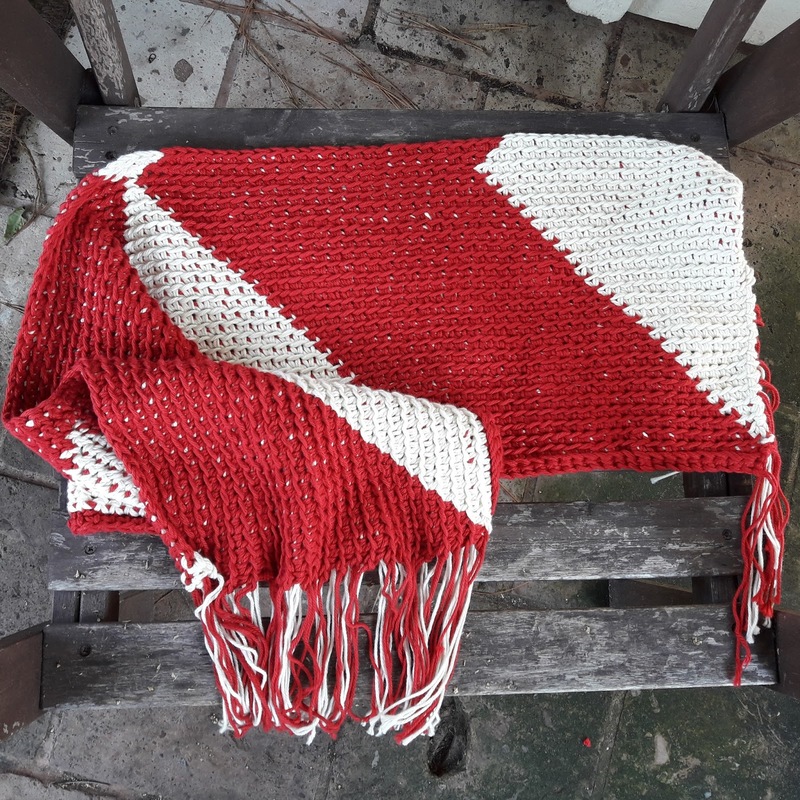 But I am also very tempted by the crochet version of the Wonder Woman Wrap designed by Clarissa Browning who also designed the knit version. And I still haven't made a Blurre Shawl and I really want to. The chatter thread for the shawalong is on Ravelry here. Hannah is also going to be running a Tunisian Crochetalong with Claudia from the Crochet Luna Podcast and I believe Claudia will be talking about this in her podcast this weekend. Another CAL to look forward to! Emma from the Potter and Bloom podcast has a shawlong (well it's actually a stolealong rather than a shawl) with a pattern that she designed herself Liula which runs through September and October. Emma's stole is a beautiful stitch pattern and uses a color changing cake of gradient yarn hence the name #cakecal. Here's the chatter thread in the Potter and Bloom Ravelry group. I just watched Emma's most recent podcast and the CAL will run for an additional two weeks to a month to give everyone a chance to buy their yarn. Rohn Strong has a crochet sock CAL running in collaboration with Happily Hooked Magazine which started just yesterday, September 1st. There is a Happily Hooked Crochet Along group on Facebook to join. The design looks lovely. I am a total sucker for crochet socks so I might have just have to join in while I wait for my CAKECAL yarn!! This CAL/KAL/QAL (is a quilt along called a QAL?) is already running and the dates to get your blankets sent off by has recently been extended to November 4th. The blankets are currently being displayed at the Smart Museum of Art at the University of Chicago. When the show ends all of the blankets will be given to refugees and immigrants to welcome them to the US. We moved here five years ago and were made to feel very welcome in Texas so I feel that this is a good craftivism cause to participate in. Further details (and patterns) are here. 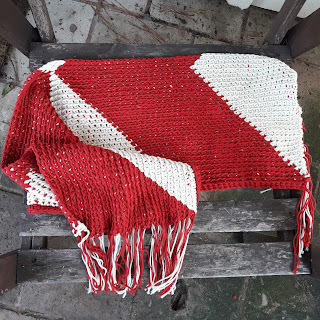 I'm using one of the designs but rather than crocheting squares and joining them together I am making a tapestry crochet blanket in two colors with tassels at the sides (see the photo). Anyway I'd love to know if you're joining in on one or more of these CALs and if there are any more CALs going on please add these in the comments for us all to see. Have a wonderful week everyone!! Your blanket looks beautiful 😍 Stop sharing CALs - I'm totally focused on what I need to do until someone mentions a Cal, and then I *need* to join in. Wanted to try the Liula for Christmas present(s? ), I have a tunisian shawl waiting to be made, I like the sound of the sock Cal and I need to check out this Spotting Clouds top. Plus of course, a sweater I need to be working on. Giving up sleep! Thank you Sam! I'm enjoying my blanket and it's working up quite fast because I doubled the yarn - just as well with all these CALs to consider! I promise I won't mention any more (well apart from the third annual Holiday Stashdown Crochet Along with CAL Central Crochet which starts on Monday.) Ooopps I'm such a bad person! Ooh, thanks for this - I'm a bit behind on podcast watching and I've somehow missed the Cozy Cottage podcast's shawlalong! Glad you found this useful Jo! I keep finding more and more crochet podcasts that I enjoy... It's a challenge keeping up (but a worthwhile one!) Ha ha. The Back to School Sweater CAL is underway!